Tapped to replace guitarist Charlie Sexton, Billy Burnette has a career deeply rooted in both rockabilly royalty (his father was Dorsey Burnette, his uncle Johnny Burnette) and mainstream rock. It was this dicotomy that likely drew Dylan to call on him to play lead guitar. 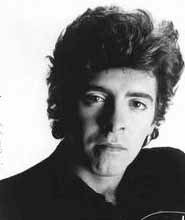 Born in Memphis, Tennessee, USA on May 8, 1953, Burnette was on the road touring with his father while still a teenager. In 1971, he signed a solo record deal and released his first self-titled album for Entrance Records. In 1979, he signed with Columbia Records and released a second self-titled album. Other releases followed sporadically. After playing in Fleetwood Mac drummer Mick Fleetwood's solo project, the Zoo, in the early 1980s, Burnette joined a cast of musicians that frequently collaborated with the Mac members on their assorted solo outings. Burnette co-wrote a song with keyboardist Christine McVie, recorded with singer Stevie Nicks, and played with guitarist Lindsey Buckingham. These connections would eventually pay off. When Buckingham left Fleetwood Mac in 1987, Burnette and guitarist Rick Vito were asked to join the group. He recorded several albums with them, including "Greatest Hits," "Behind the Mask," "The Chain," and "Time." Burnette also recorded with sometime Fleetwood Mac singer Bekka Bramlett. The mid-'90s reunion of the Buckingham/Nicks lineup of Fleewood Mac effectively ended Burnette's time with the band. DISCOGRAPHY: His projects: "Billy Burnette," "Billy Burnette," "Gimme You," "Coming Home," "All Night Long," "Are You With Me Baby."